Google AdSense 300×600 Ad Unit finally became available to all the Publishers. Half page unit needs more careful placement and here is guide. We published an article named Half Page Ad Format (300 x 600) “ The Less Known Ad Format more than a year ago and the poll clearly shows, publishers were quite interested about this king size Ad unit. 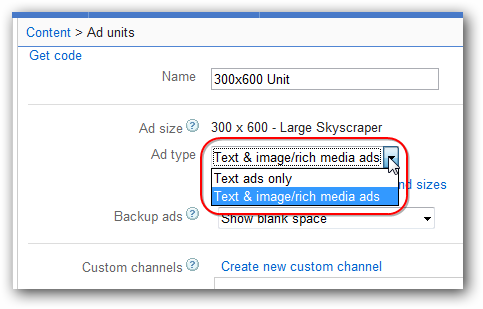 Google AdSense 300×600 Ad Unit is officially known as Large Skyscrapper. There lot of helpful articles than really you can imagine. Just search with Google AdSense in the search box. It will look odd if we link all the articles in this guide article on Google AdSense 300×600 Ad Unit. Official blog on 300×600 Unit from Google is here. As you can see on the above screenshot, there are two options of Ad Type. Google AdSense 300×600 Ad Unit was only for Premium AdSense accounts because of a big fact – it requires more control as it is really larger than life. This larger than life feel can be good or bad for your blog. We suggest to Deliver this AdSense Ad unit through DoubleClick for Publishers (DFP). This Google AdSense 300×600 Ad Unit or rather Half Page is never should be never among main Ad Units – it will be a content distraction factor plus, AdSense by default do not open a new webpage, it is bounce for your website. So, always make it a secondary unit by delivering through DFP. The reason to show you the screen shot is – there is no option for displaying only image Ads. Other than image, 300×600 Ad Unit looks odd, specifically, text Ads simply can make a content web page looking like a parked website. This Article Has Been Shared 8389 Times! For a blog you need huge effort, investment of time and money for the server, optimization etc. So, you need some money in return. AdSense Text Ad Color Blending and Contrast is main ingredient to increase CTR. Finding the right not easy as it seems, Google itself spends a huge to find the perfect combination. Lake Quincy Media is sponsoring us for the past one year. How is our experience with the Leading Developer Ad Network? Cite this article as: Abhishek Ghosh, "Google AdSense 300×600 Ad Unit : Implementation Guide," in The Customize Windows, November 15, 2012, April 21, 2019, https://thecustomizewindows.com/2012/11/google-adsense-300x600-ad-unit-implementation-guide/.